Screenplay: Vincenzo Natali, Doug Taylor, Antoinette Terry Bryant. Starring: Adrian Brody, Sarah Polley, Delphine Chaneac, Brandon McGibbon, David Hewlett, Abigail Chu. Director Vincenzo Natali showed great potential with his earlier low-budget science-fiction films “Cube” and “Cypher”. Now a bigger studio has shown faith in him, as have two very fine actors in Sarah Polley and Oscar winner Adrian Brody, amounting to good results. Elsa (Polley) and Clive (Brody) are two very ambitious genetic engineers asked to splice together materials from several animals for research. In secret, they include human DNA, creating a new creature which matures at an increased rate. Elsa and Clive nurture ‘Dren’ (Delphine Chaneac) the female organism, becoming both scientist and parent to it and take it to an isolated farm for further study. 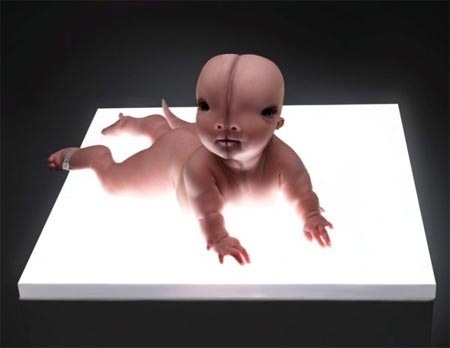 However, Dren’s development, and Elsa and Clive’s skills as parents become dangerously problematic. Natali’s third feature is very like “Mary Shelley’s Frankenstein” in narrative. It deals with the creation, then subsequent lack of nurturing, leading to powerful and dangerous consequences. Strong themes are explored, asking ethical questions and for a change, we get a film that has the courage of it’s convictions and doesn’t shy away from addressing the conflicts or inhumanity of the main characters. Brody and Polley do a fine job and Chaneac is excellent in a difficult role, while Natali crafts a very enjoyable little Sci- Fi/Horror film, of which, are few and far between. Most films of the genre assault us with CGI but this has a solid story in its favour and delivers it effectively, leaving you feeling uncomfortable with the abuse and affection the creators have for their creation and surprised with the emotional core throughout. A quality modern horror, that’s a little slow to get started but highly satisfying in the end. This entry was posted on January 28, 2012 at 12:34 pm and is filed under Horror, Science Fiction with tags 2009. You can follow any responses to this entry through the RSS 2.0 feed. You can leave a response, or trackback from your own site.